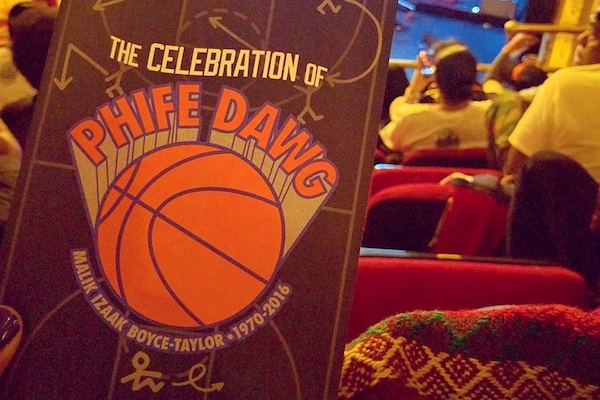 Watch Kanye West, André 3000, The Roots, Others Pay Tribute at "The Celebration of Phife Dawg"
“The Celebration of Phife Dawg” tribute event took place at the Apollo Theatre in Harlem tonight, and as was promised, an all-star lineup turned out, including Kanye West, André 3000, The Roots, D’Angelo, Chuck D, Busta Rhymes, KRS-One, Consequence, Grandmaster Flash, and others. Busta Rhymes got emotional when talking about his former collaborator, coming to tears. “I just want to thank my man Malik Taylor, Phife Dawg, the Five-Foot Assassin, for being the big brother I needed when I was at a crossroads in my life,” he said. André 3000 also said that “Outkast would not be Outkast” if not for Phife Dawg. Check out some footage from the event below.